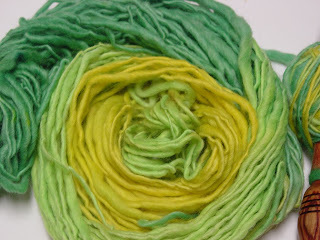 I dyed some yarn over the weekend in some nice shades of green. I was hoping for a nice striping effect but I don't think I am going to get it. On a good not, my basic knit stitches go a lot faster. I also apparently figured out how to hold my needles to get a looser gauge. I'm mostly happy with this but there are a few glaring errors that may or may not be visible in this picture.